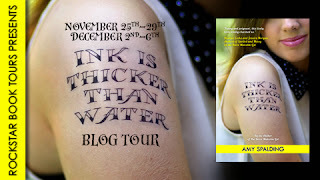 Welcome to the blog tour for Ink is Thicker Than Water by Amy Spalding! This tour is hosted by Rockstar Book Tours and will be running from November 25th to December 6th. Be sure to check out the other tour stops by clicking the banner above or following the links at the end of this post. Also, enter the tour-wide giveaway below! For Kellie Brooks, family has always been a tough word to define. Combine her hippie mom and tattooist stepdad, her adopted overachieving sister, her younger half brother, and her tough-love dad, and average Kellie’s the one stuck in the middle, overlooked and impermanent. When Kellie’s sister finally meets her birth mother and her best friend starts hanging with a cooler crowd, the feeling only grows stronger. But then she reconnects with Oliver, the sweet and sensitive college guy she had a near hookup with last year. Oliver is intense and attractive, and she’s sure he’s totally out of her league. But as she discovers that maybe intensity isn’t always a good thing, it’s yet another relationship she feels is spiraling out of her control. It’ll take a new role on the school newspaper and a new job at her mom’s tattoo shop for Kellie to realize that defining herself both outside and within her family is what can finally allow her to feel permanent, just like a tattoo. A little while ago, I wrote a review in which I stated one of the reasons I liked the book so much was because it was quiet and didn't make a bid deal about itself. 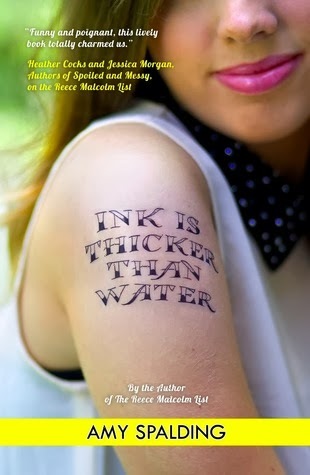 The same really goes for Ink is Thicker Than Water. This book is such a great example of what life as a normal teenager really can be like. Kellie goes through so many things in this book, but it was all handled quite realistically. There's drama and family issues and all that, of course, but it doesn't slap you over the head with it and the drama isn't blown out proportion. I really found myself relating to the themes and characters in this novel. I think it's a true testament to the talent of the author when a story can speak to a reader on more than one level. Ink is Thicker Than Water definitely rings true with the good, the bad and the ugly parts of growing up. 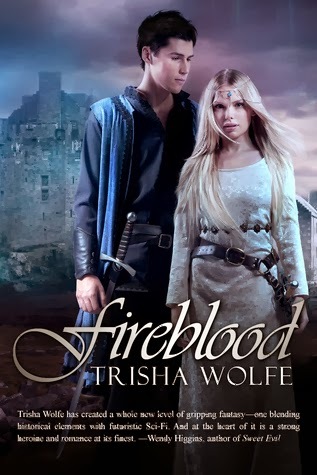 Welcome to the blog tour for Fireblood by Trisha Wolfe! This tour is hosted by the ever-wonderful, Rockstar Book Tours. 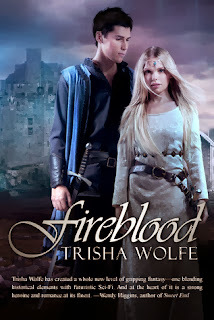 For my stop, I had the great opportunity to interview author Trisha Wolfe! So find out about this book, look at my interview and check out all the other fun stuff! Be sure to visit the other tour stops by clicking the banner above or following the links below. Also, don't forget to enter the awesome tour-wide giveaway! So without further ado, here's Fireblood! Oh my word, this book is SO GOOD! Non-stop crazy awesomeness. 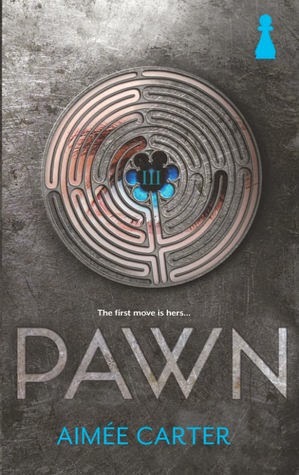 Pawn has political intrigue, a family that is so messed you can't help but wonder how they function at all, love, betrayal, faith, hope, despair... this book seriously has it all. Some things are so horrific, I couldn't see how the main character, Kitty, could possibly remain sane! Welcome to the Book Blast for Unstoppable by S. R. Johannes! This whole series looks really interesting, so I knew I'd have to take part in this blast. 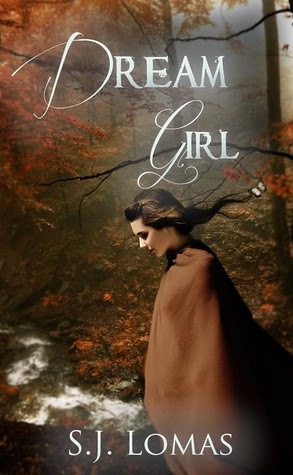 Below you'll find the synopsis for this awesome looking book, a bit of information about the author and even a giveaway. Fun, right? 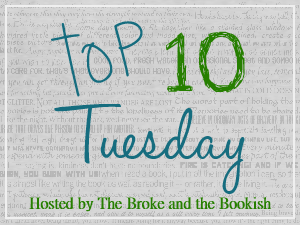 So add this book to your TBR pile and then enter the giveaway! Hmmm... does anybody else think of this Santigold song every single time they see the title of this book? Well, do you? Am I alone in this? ... Oh dang. Le sigh. Anywhoozle... on to the book blast! After everything that has happened, Grace goes to the Everglades to live with her grandmother, Birdee. Even though she is now home-schooled by her bird-obsessed grandmother, the move gives Grace time to relax. She learns to scuba dive and starts boating with old man Rex, Birdee’s casual friend/boyfriend. One day while out in the marshes of the Everglades, Grace rescues an abused Florida panther, currently on the endangered list. The more she dives into the animal’s horrific condition, the more she ventures into the underground world of the roadside zoos that run rampant in Florida with a total disregard for the law. Eventually, she stumbles upon one large roadside zoo filled with a variety of endangered and illegal animals. Before she can gather evidence and report her findings to the authorities, she is kidnapped by the ruthless owner and dragged deep into the Everglades for a hunting challenge. Only this time, Grace is the prey. During a sick game of cat and mouse, Grace is offered one chance at survival. With a one-hour head start and very little supplies, time and skill are now all that stands between the hunter and the hunted. The topic this week is Top Ten Covers I Wish I Could Redesign. So, I have a love/hate relationship with covers. Some are so hideous, and so wrong, I can't believe they were ever printed. Others are redesigns that I just... I just don't understand why they would do it. There are those that are just hard to look at and those that don't fit the story at all. I'll admit that I am one of those people who judge a book by its cover. Well, maybe not judge a book by the cover, but I have been known to pass on books with covers that just don't speak to me. Likewise, if a book has a really interesting cover, I'll at least pick it up to read what it's about. Love them or hate them, covers can play a huge part in pulling readers in or pushing them away. Welcome to the cover reveal for Kelly Oram's Ungifted! Ungifted is the second book in the Supernaturals series. If you'd like to read up on book one, Chameleon, download it now . I've loved every single book I've read by Kelly, so I'm sure this one will be amazing as well. Now without further ado, time for the cover reveal! 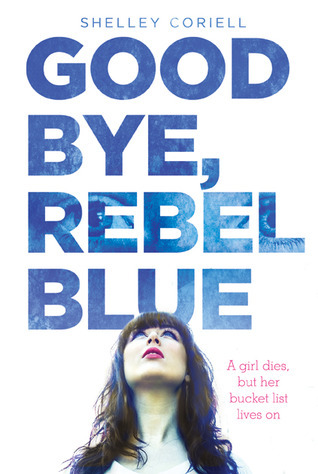 Rebecca Blue is a rebel with an attitude whose life is changed by a chance encounter with a soon-to-be dead girl. Rebel (as she’s known) decides to complete the dead girl’s bucket list to prove that choice, not chance, controls her fate. In doing so, she unexpectedly opens her mind and heart to a world she once dismissed—a world of friendships, family, and faith. With a shaken sense of self, she must reevaluate her loner philosophy—particularly when she falls for Nate, the golden boy do-gooder who never looks out for himself. Sometimes a book comes along and totally surprises you. Goodbye Rebel Blue really snuck up on me. It's kind of a quiet book, in a way, and it doesn't really make a big fuss about itself. It simply is. I love when I'm reading a book and I don't even realize how it is affecting me, until I catch myself thinking about it or talking to someone else about the characters or story. That's what I mean by it snuck up on me. That's what I mean when I say it's a quiet book. I seeps into your heart and becomes part of you, without you even realizing it's happening. This is a sign of a great book. I got two done! Woo hoo! Sure, they were done at the end of the month, but still. I'm getting better at this... I hope. Yay! Hooray! It's time for a surprise giveaway! For those who actually look at the Facebook page, remember when I said I might have a surprise coming? Well, this is that surprise! I've decided to declutterfy (that is totally a word now because I just said it... so there) my bookshelves. As part of this declutterfication (ooh look, another new word! ), I'm giving books away! 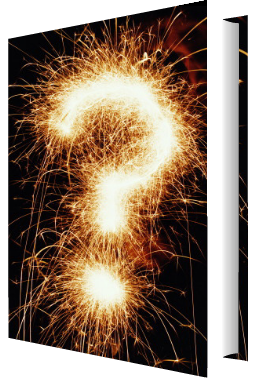 What am I giving away? Well, I'm going to give away some of the ARCs sitting on my shelves. These poor ARCs need some new homes, so I thought you guys might like them. As for which ones I'm giving away, I'm going to make this a surprise. I have kids, teen and adult fiction titles, so the books in this giveaway box could be any combination of those. How many am I putting in the box? I'm not telling you that, either. Bwahaha! The topic this week is Top Ten Sequels I Can't Wait To Get My Hands On. There are actually quite a few I'm eager to have. Some are true sequels whilst others are maybe a little further into the series. Some of them I've put off reading until the last book comes out and some are even on their way to my eager hands right now! There are so many wonderful books to look forward to, you guys. My only limitation is how fast I can read... and how much time I have to sit down and read. Let's get this list going, shall we? !